I finished my new pink hat last night! I'm not sure whether or not it's a success, but I'll try to get pictures of it today and maybe you can weigh in tomorrow. Meanwhile, I've been worrying a bit about the summer hat situation. A good hat is essential to this effort but the best hats are the ones you can scrunch up and stuff in your bag, and the hat I loved for this purpose - the hat I found by accident in a department store a few years back, a perfect shade of grey in a linen/cotton blend, which looked lovely on and off and scrunched beautifully oh I could cry - has had its biscuit and eaten it, leaving crumbs all over its brim. 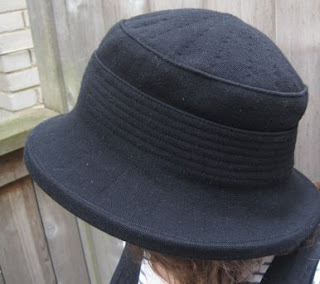 One thing it does offer is scrunchability, except maybe for the hoop that shapes the brim. And shade. Whew. Do you know how many pictures it took to get one that showed a bit of my face? A lot. Now the trick is going to be pulling this thing off like an everyday accessory, not something just for weddings. Because it really looks like it should be jetted off to London for a big society 'do, don't you think? Meanwhile, I think I will keep looking. Or maybe I will take apart the old cotton/linen hat and try to copy the pattern to sew a new one because ohhhh the linen, it is so comfortable. Have a lovely Wednesday - see you tomorrow with more hats on! 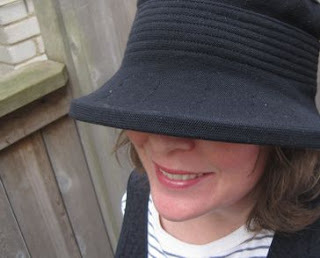 what is the name of the Black Parkhurst hat in the picture? I have the same hat and have been looking for another one, but I don't know what it's called: all Parkhust hats have a name. You know what, I wasn't able to find any mention of this hat online at the time, either, when I was looking for a better photograph of it to post... I wonder whether it was a limited run exclusive to a few vendors? (mine came from The Bay.) There's no name or SKU number inside mine unfortunately. I hope they didn't do it for just one season as it's a great hat!